I received a text from Koodo on Jan 30 saying that I reached 50% of my data. The next day I received another text saying I reached 90% and a second later another one saying I reached 100% and my data is now cut off until the next billing period starts. It is not possible that I would have gone over 50% of data in just one day, nor do I recall using data more than I usually do. So this must be some kind of a glitch. 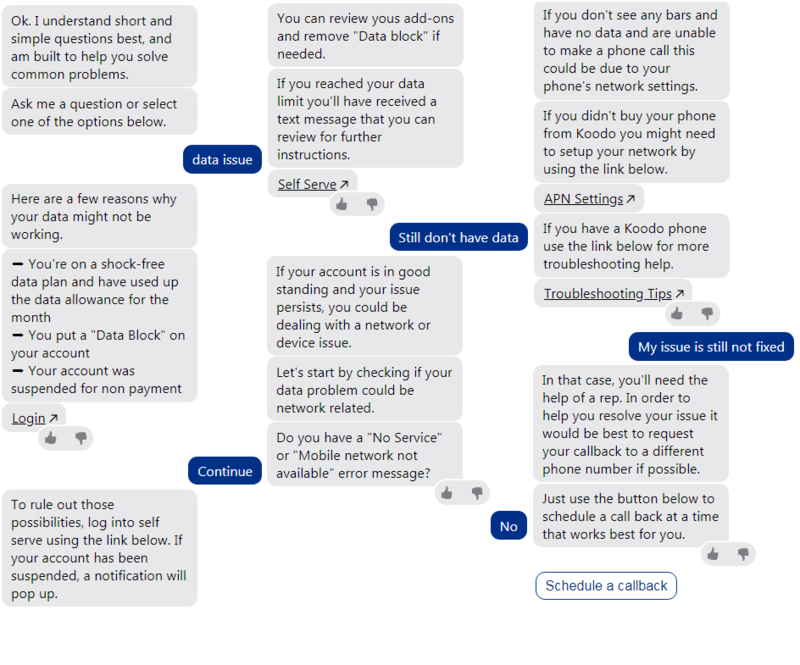 My biggest issue, aside from the fact that I immediately lost data, is the fact that there was NO way to reach anyone at Koodo except for the useless Virtual Assistant, which did not give me any options to speak to a rep or a 'callback' option that some people get. This forum is my last resort, otherwise I have to switch providers, because this level of customer service is completely unacceptable. I need a proper explanation as to why my data was turned off, and which activities led to the data filling up in a matter of 1 day. Self-serve doesn't provide details on what the data was used for, only times. You data was turned off because you reached your limit. It should have also given you an option to buy more in the text you received. See if the link below helps you determine what was using your data. How much data does your plan have? The virtual assistant will give you the option to request a callback if you ask it to do that. You can also message Koodo on Facebook or Twitter. Well, smart phones can consume 1,2 GB in 15minutes or 1,2 hours. This data loss could be due to many reasons, have you checked your self service >> view usage>> data. You should be able to see the time & data amount consumed. Also I would suggest you check your data consumption in your phone. What did you see there? did you see any app that consume more data than before? Koodo can’t tell you WHAT the data was, or what site it was drawn from. The info is not collected. Like the odometer on a car, it tell how far you went, but not where. I love it when people say it was impossible to use up their data. It's actually exceedingly easy if you're not meticulous about every system setting, every app background refresh setting, etc. What did you ask the assistant?